Late last summer my girls and I went to a barn sale. This barn had been closed up for years and many of the items had water damage due to a leaky roof. It was one of those days when you have to get in and dig to find good stuff! I fell in love with the detail on this drawer! I’ve been wanting to bring in some green to brighten my home for Spring (I don’t do much color!). 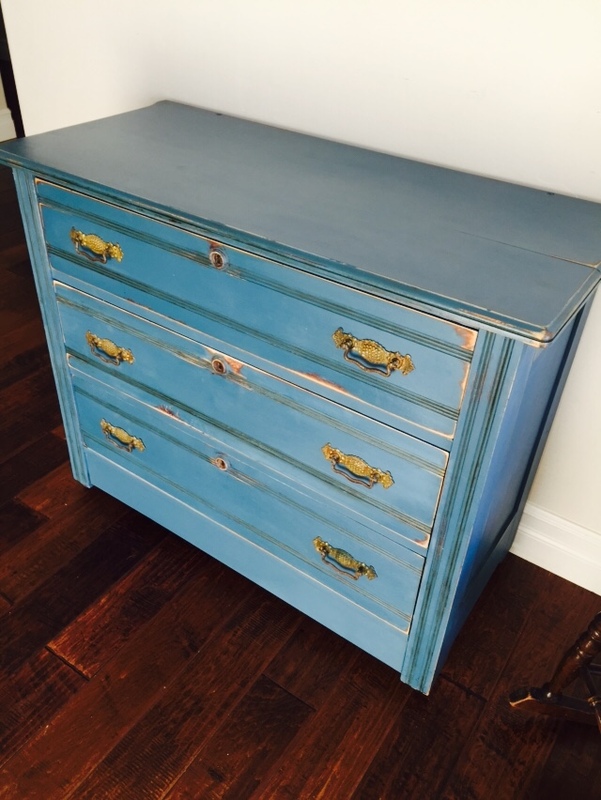 I washed as much of the uh…well, bird poop…off the drawer and then painted Antibes Chalk Paint® which covered the rest! Wowie-that’s bright! 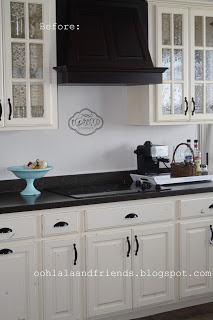 I love Pure White Chalk Paint®. A dry brushed some on to mellow the drawer a bit. I sanded this before clear waxing to give it a more vintage worn feel. A few new knobs and “Ooh La La”! I quite like the finished piece. I love using drawers, trays and cutting boards to hold my decor on the tables in my house. It’s easy to move out of the way for meals and I sure don’t want to let a decorating spot in my home go untouched! I love the Artisan Enhancement Crackle Tex. One coat over this wooden mantel followed by Old White Chalk Paint®, Clear Wax and a bit of Tinted French Linen Wax and….well…..OOH LA LA! The trick with the crackle is that you can only put one coat of paint on-so it needs to be a fairly thick coat of paint. And the test for me was to trust and walk away and let the Crackle Tex do it’s job! You can’t control the cracking-it was a challenge for me as I tend to be a bit of a perfectionist! But….the results were fabulous! Our friendly staff is available Wednesday-Saturday 10:00 a.m. to 5:30 p.m. to assist with you your painting needs! I’m really sad that I don’t have a before picture of this amazing piece to show you. it is one of my favorite transformations. It had a darker wood inlay where the white bold stripe is. 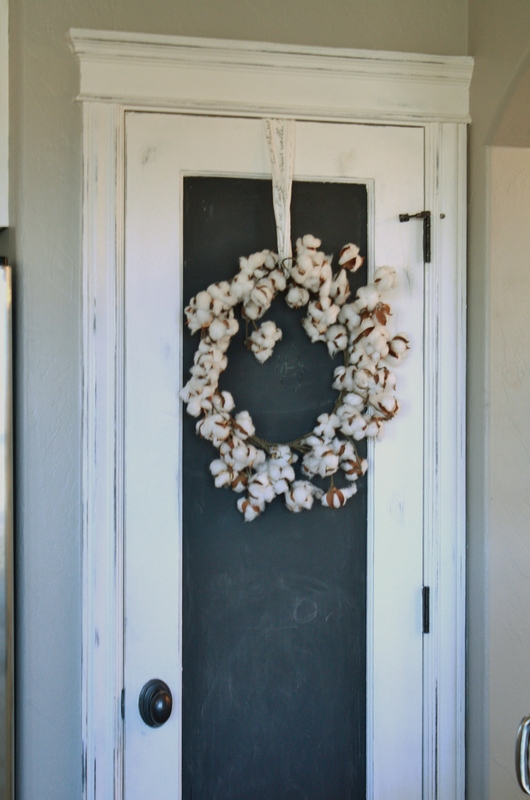 I really wanted to keep the two tone in the update so I decided on Pure White and French Linen Chalk Paint® so I would have a good contrast between the two. I had just repainted the walls in my house with a pale taupe color and this matched it perfectly. This dresser has so much detail but I really didn’t want to use the dark wax with the Pure White so I applied a clear wax followed by some light distressing and then applied a Pure White tinted wax to highlight the details. I especially like when the knobs and pulls are in great shape and have detail. Painting these with Pure White tied everything together. Sorry-this one is mine and won’t be for sale at Ooh La La & Friends Boutique (Yay I finally finished a project of my own!) but come on by and I’ll be happy to help you recreate this look!! 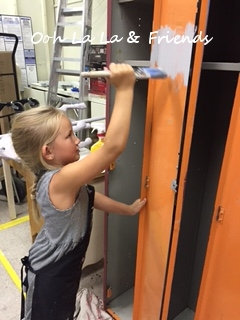 One of the advantages of having a family owned business is involving the grandchildren in our painting projects…everyone has fun! Kids love to paint and there are no harmful VOC’s in the Chalk Paint®. 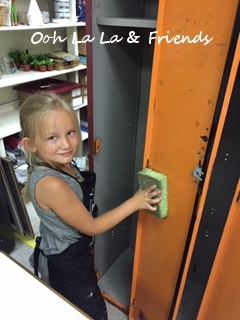 Addi helped clean and paint these lockers. We choose Paris Gray for the inside and Graphite for the outside. Two coats covered the original red and orange surface. We painted hardware and metal tags as well to give them a clean uniform look. The lockers were then dry brushed using the Artisan Enhancement Product Pearl Plaster and then sealed with Artisan Enhancement Clear Coat Finish. 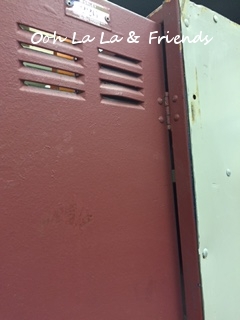 This combination gave these lockers an industrial look. We are excited to share a few projects from this years Furniture Painting Contest featuring Chalk Paint® and Artisan Enhancements. Winners this year are Masie Richards and Katrina Goodrich. Each were selected in a random drawing. We could never judge these projects and make a decision as to our favorite! They are all unique and beautiful. Thank you so very much for sharing your projects with Ooh La La & Friends. The first submission from Krista turned out so cute on this dining room set! These great projects came in from Robin…so pretty and very elegant! 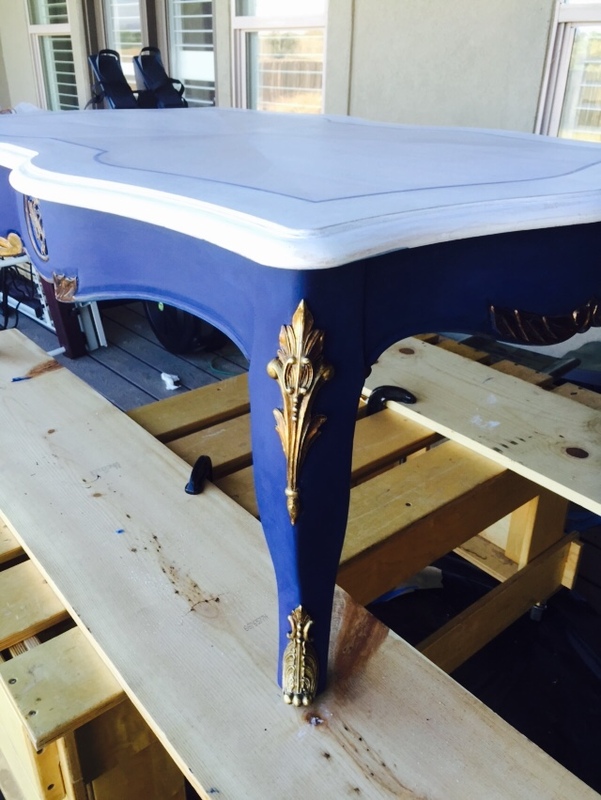 She stripped the the top of the table since she wanted to lime or white wash it.The bottom and legs were painted with Napoleonic Blue and a gold on the details. A thinned out mix of Old White and Pure White were used on the outer edge of the top. A very small detailed stripe was added with the Napoleonic to separate the painted edge and the lime wash. Clear and dark wax were used on the legs and clear wax on the top. Upon finishing she finished by buffing it for extra shine! 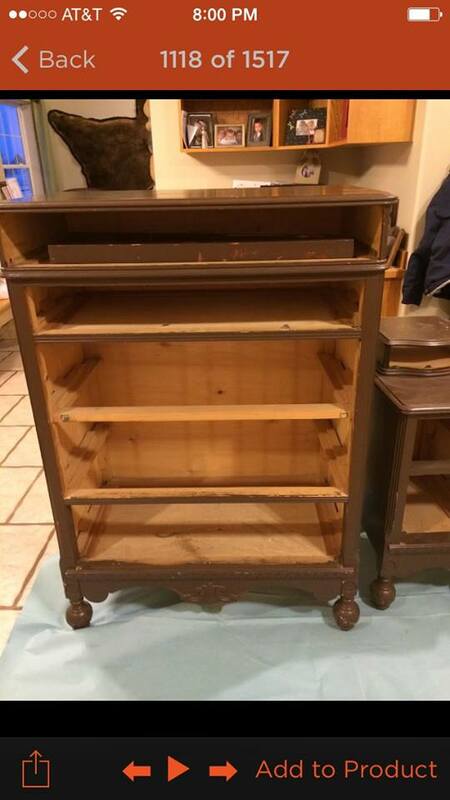 Julie chose to paint her entry table using Burgundy and Pure White Chalk Paint®. We love the stencil she used from Royal Design Studios-what a beautiful contrast between the two colors. Brett completely changed the look of this dresser into a very chic entertainment center using a mix of 60% Graphite and 40% Old White and then using Clear Wax on the entire piece. This color pairs with the dark stain very well. 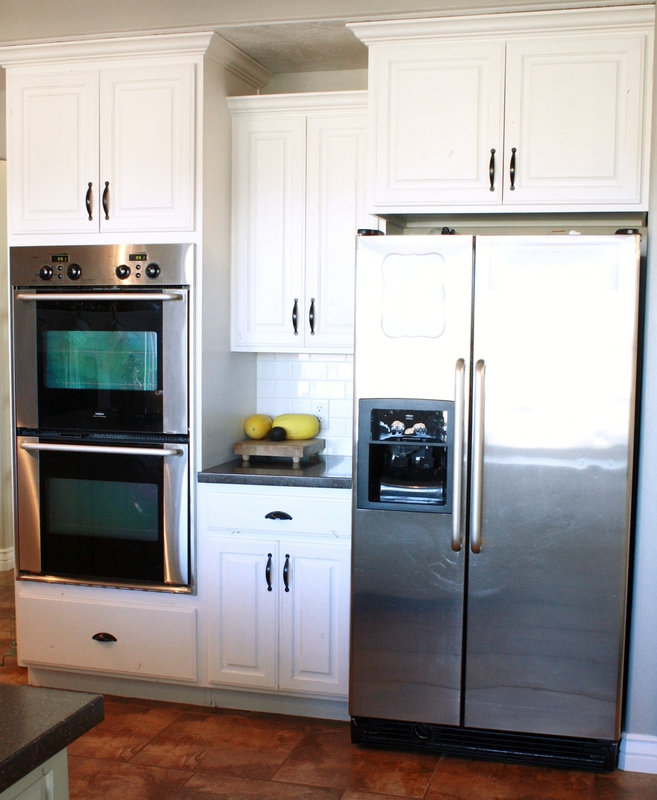 We love how the diamond knobs tie into the metal mesh used on the doors! 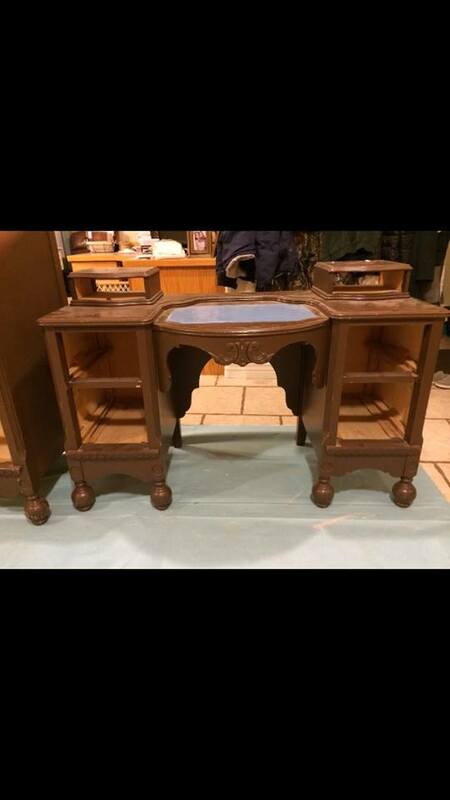 Averee totally changed the look of this hutch from dated to fabulous. The hint of Antoinette adds to the vintage feel of the piece. Well done! Brittney isn’t afraid of color and we love it! This is a great transformation of this piece and shows how the paint sets off the detail! This piece was completed with Antibes and Florence. Darian updated this piece from dated light oak to this using Paris Gray and Pure White with Clear Wax and some light distressing. 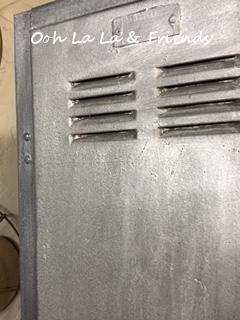 The knobs and plaq are painted using Graphite. 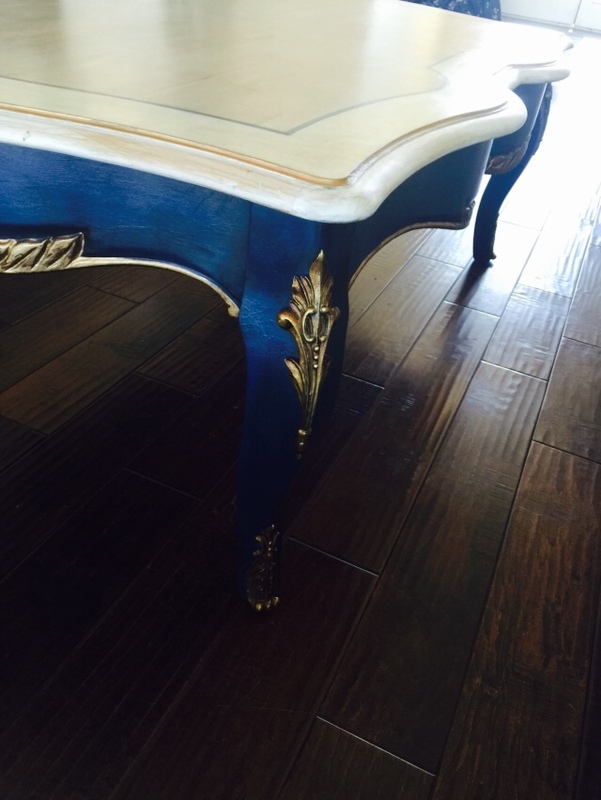 Jeanette fell in love with this table after base painting it Paris Gray and Antoinette. She then used a Royal Design Studio stencil and Pure White on top and clear waxed! This combination gave the piece a very feminine feel-the lucky girl that get’s this will be happy! Macy did a lime wash by using diluted Chalk Paint® on raw wood and then hand painted the wire and stenciled the birds. She used both the clear and dark wax-the dark wax made the wood look richer! She also completed a frame using the Louis Blue, Clear Wax and then tinted Pure White Wax. Lightly distressing to the gold underneath and then adding a bit of silver Gilding added depth to the frame. Sue gave a great update to darling maple furniture piece that was handed down to her and her husband by family members. The completed piece looks so clean and bright! 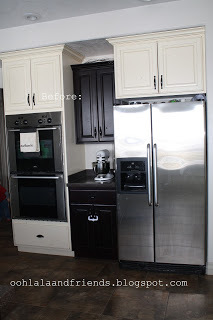 Brandi used Pure White, Coco and then French Linen followed by Clear Wax to get a “greige” look on her kitchen cabinet update. Impressive change! 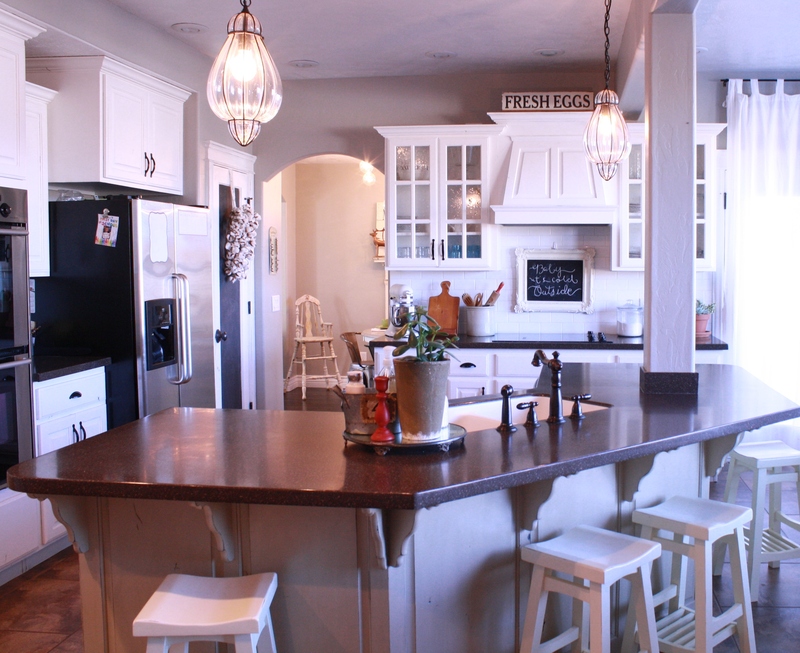 Shayln updated her kitchen island and chairs. Look how much fun this update is! 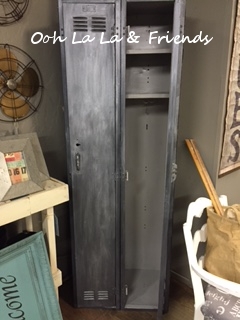 Lisa transformed this wardrobe using Graphite Chalk Paint®. It now has a totally new look! We love how the handles pop and the details shows up so well. 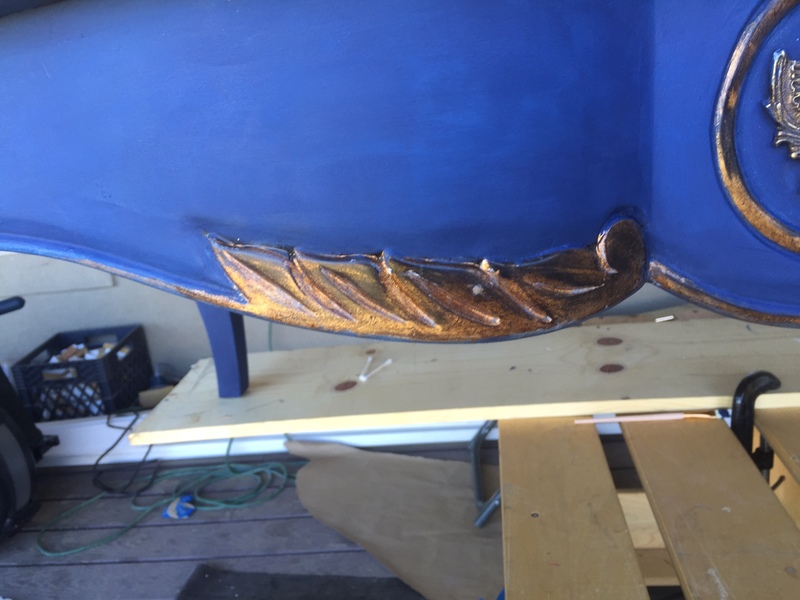 The before of this piece submitted by Katrina was brown and didn’t match her house. Ooh La La….look at it now! 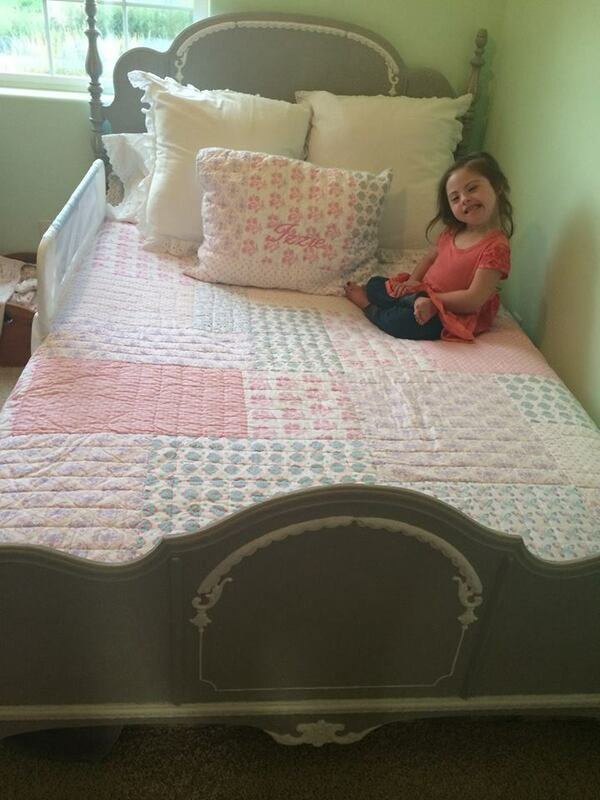 Elsie did this amazing bedroom furniture makeover. Look at the beauty in the detail of these pieces! Julie’s before and after of a few projects-each one unique and amazing! Old Violet and a custom mix of Old White and Pure White with a rag technique on the top. There’s a surprise of Emile inside the drawer finished with clear wax. The vintage French Provincial Dresser needed the old decals removed before it was painted with Old White and Coco with Clear Wax. The mirror is completed with Old White and Dark Wax. Darling table Coco and Old White with Clear Wax. And the wonderful update to the dresser is in Paris Grey, Pure White and Clear Wax. Sharelle send it this furniture update! Love! Britney totally changed up this dining room set using Antibes, Paris Grey with clear and dark wax. The stencil from Royal Design looks amazing! Bisty totally changed the look of this natural wood nightstand by staining the top with a mahogany stain and sealing with the Artisan Enhancements Sealer and then painting the bottom Graphite with clear and dark wax. Love the new look! Bitsy’s bench makeover is awesome as well. She painted the legs Coco, the top Pure White and then stenciled with Provence followed by clear wax. 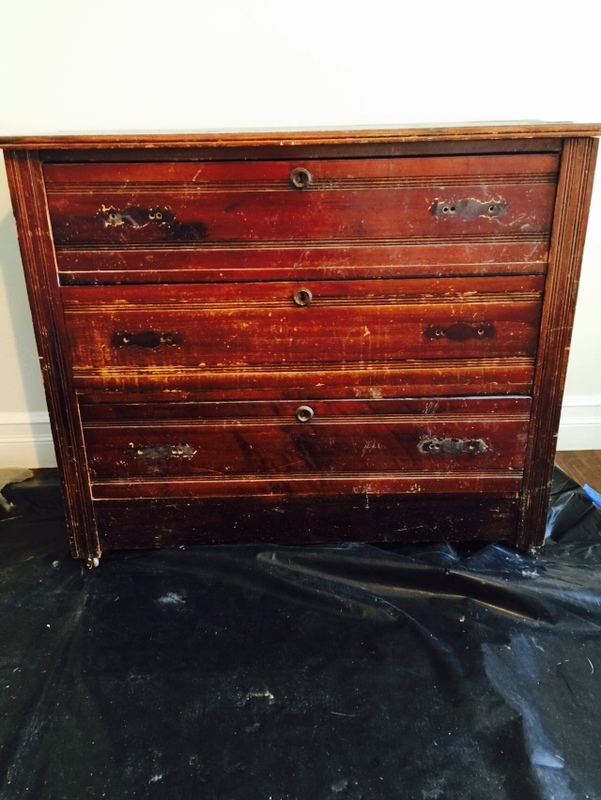 This old dresser was painted with Henrietta and the handles and baskets with Graphite. The entire piece was then dark waxed! This cream colored leather chair was painted with Coco and then dark waxed. What a great result! Masie first painted these Florence and then decided Graphite would be best in the playroom. That’s the great thing about it-you can always paint over the paint to change it! The crib was painted using Emperor’s Silk and Clear Wax. It totally changed the look–we love it!